In my own life, I found that whenever I wasn’t sure what to do next, I would go and learn a lot, read a lot, talk to experts. 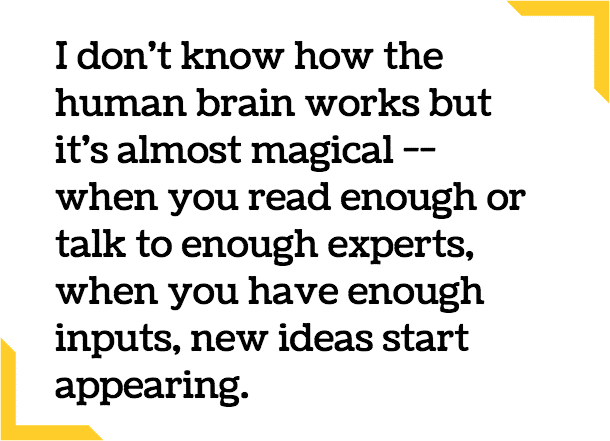 I don’t know how the human brain works but it’s almost magical: when you read enough or talk to enough experts, when you have enough inputs, new ideas start appearing. This seems to happen for a lot of people that I know. You truly need to go read this entire article. It’s brilliant throughout, and it’s remarkable in the way that I like most. The sneaky kind. The kind that seems simple and obvious but that very few people do. It’s like he’s describing my exact approach to solving problems and being creative, only he’s doing it at a dedicated, godlike level where I’m just sprinkling the methodology onto whatever project I’m working on. What I like most about the piece is how he focuses on inputs creating output. More specifically, he talks about what I’ve specifically identified as my means of becoming excited and passionate about creating things. That’s it. That’s what started it for me. And even today, the more I read, the more I process what I have read. I just keep having more and more ideas. It’s so remarkable that I often create two or three notes or actual essays right in the middle of reading something else. And it’s often not even on the same topic. Ideas simply generate ideas—even if they’re not in the same area. My takeaway is simple: if you’re the person who never has good ideas (or feels like you don’t), you need to start reading. Read what the best people think about things. Things you care about. Things that interest you. And read good fiction. Think of it as exercise, but magnified by 1,000. You work your mind by exposing it to ideas, and it will start producing ideas of its own as a result. For me it comes as a deluge, and it’s exhilarating. Good conversation works much the same as reading.